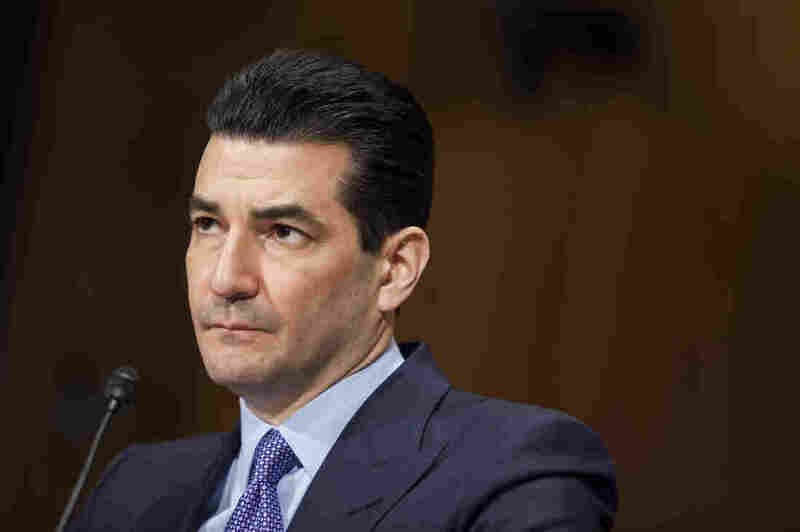 FDA Commissioner Scott Gottlieb Announces He Will Resign : Shots - Health News Gottlieb, who will resign in a month, stood out in the Trump administration for his efforts to regulate the tobacco and pharmaceutical industries. The reasons for his resignation are not yet clear. FDA Commissioner Scott Gottlieb announced Tuesday that he is resigning the position, effective in one month. He is seen here testifying during a Senate Health, Education, Labor and Pensions Committee hearing in April 2017. Gottlieb is a physician who was previously the FDA's Deputy Commissioner for Medical and Scientific Affairs. He became commissioner in May 2017. The reasons for his resignation are not yet clear, but it appears it was not requested by the White House. President Trump tweeted his high regard for the commissioner on Tuesday afternoon, writing that he has done "an absolutely terrific job. .... Scott has helped us to lower drug prices, get a record number of generic drugs approved and onto the market, and so many other things. He and his talents will be greatly missed!" Gottlieb tweeted in return that he was "immensely grateful for the opportunity" to lead the agency. During his tenure, the FDA cracked down on electronic cigarettes, saying that vaping among teenagers had reached "an epidemic proportion." The agency issued more than 1,300 warning letters and fines to convenience stores, gas stations and other stores last summer for selling e-cigarettes to minors. Gottlieb also announced he would seek a ban on menthol cigarettes, a move welcomed by public health advocates. The Campaign for Tobacco-Free Kids applauded his work to regulate tobacco and e-cigarettes, but noted that his proposals have yet to be enacted. "Commissioner Gottlieb has made several bold proposals that, if implemented, have the potential to save more lives from tobacco use than the actions of any previous Administration," the group's president, Matthew Myers, said in a statement. "Commissioner Gottlieb's legacy will depend on whether his many proposals are implemented and, in the case of the youth e-cigarette epidemic, strengthened going forward." Gottlieb also made efforts to lower drug prices included the release in 2017 of the Drug Competition Action Plan, aimed at reducing barriers for cheaper, generic versions of drugs getting to market. Gottlieb targeted drug makers who use tactics intended to delay the development of generic versions of medications — such as refusing to release drug samples that are needed to develop generics. Under Gottlieb, the FDA started publishing a list of complaints against companies for such tactics. "One of the barriers to competition that concerns me the most is when companies game the system by taking advantage of certain rules and laws," Gottlieb said in early May. "They exploit loopholes in our system to delay generic entry. In these ways, they extend a drug's monopoly beyond what Congress intended." In a statement, Allen Goldberg, a senior vice president at the Association of Accessible Medicines, praised Gottlieb's efforts. "Dr. Gottlieb used his bully pulpit to speak out early and forcefully about brand drug companies withholding samples needed by generic drug makers, about rebate traps and other anti-competitive abuses in the pharmaceutical supply chain," Goldberg said. Gottlieb was not without his critics. Public Citizen, a consumer advocacy organization, disapproved of his recent decision to approve Dsuvia, a powerful opioid painkiller. "[H]is tenure as commissioner was marked by regulatory decision making regarding medications and medical devices that tilted further in favor of industry's financial interests rather than the interests of public health," Dr. Michael Carome, Director of Public Citizen's Health Research Group, said in a statement. Health and Human Services Secretary Alex Azar released a statement about Gottlieb's resignation Tuesday afternoon. "Scott's leadership inspired historic results from the FDA team, which delivered record approvals of both innovative treatments and affordable generic drugs, while advancing important policies to confront opioid addiction, tobacco and youth e-cigarette use, chronic disease, and more," Azar said.